Switch to a new Android device, but still have all your contents stored in iTunes? Not to worry, syncing your iTunes contents to an Android device is easier than you may think. In this article, we’ll introduce a great tool to help you transfer iTunes to Android device like Samsung, HTC, LG, Sony Xperia, Motorola, etc. iTunes to Android Transfer is a simple-to-use yet powerful application that can transfer your iTunes backup contents to your Android smartphone or tablet in several simple clicks. With a computer and an Android device, this iTunes to Android Transfer tool finds all existing iTunes backup and allows you to sync contacts, SMS, music, photos, and videos to Android over USB connection. – Sync iTunes created for any iOS devices like iPhone 3GS, 4, 4S, 5, 5S, 6, 6 Plus, 6S, 6S Plus, iPad Air 2, iPad mini 3/4, iPad Pro, iPod touch 5, etc. – Sync iTunes to Android device including Samsung Galaxy S3/S4/S5/S6/S6 Edge, HTC One M7/M8/M9, LG G2/G3/G4, Sony Xperia Z/Z2/Z3, etc. 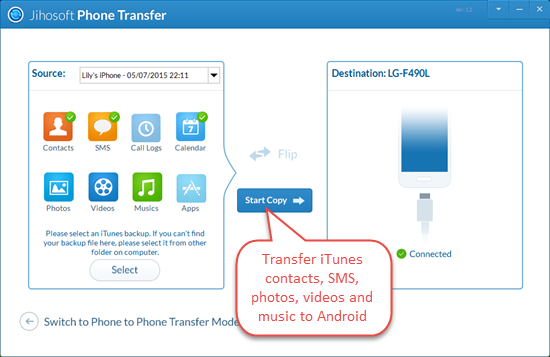 How iTunes to Android Transfer Works? 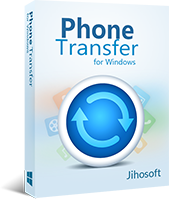 1.Download iTunes to Android Transfer and get it installed on your PC. 2.Plug your Android phone or tablet into the computer via an USB cable. 3.Run this application and navigate to iTunes to Phone Transfer mode. 4.Select the iTunes backup file and iTunes contents you wish to move. 5.Tap on “Start Copy” to begin syncing iTunes backup content to Android. My Android phone failed to connect. How to Fix? Try using a different USB cable. Some USB cables only have 4 pins which will charge the phone but not allow data to be transferred. Also, open USB debugging on your Android device. Without USB debugging enabled, any third-party tool will fail to connect and access to the file system of an Android device. Messages have been transferred, but I see nothing in my Android phone. During the process, you will be asked to change the default Message app on Android, or the program will skip copying SMS. Just tap “Yes” on your Android device’s screen to set iTunes to Android Transfer as the temporary Message app. Once the transfer is done, you can reset the Message app to the default one. My iTunes videos are synced to Android, but they won’t play on my Android phone. 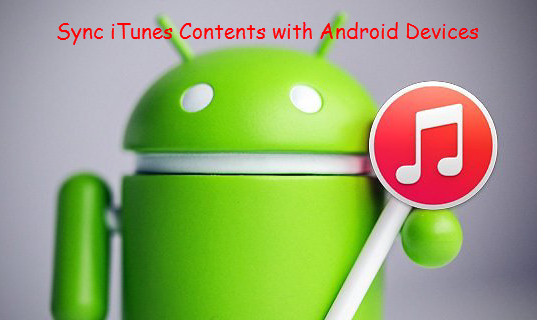 Usually, iTunes videos are in MOV or M4V formats which are not supported by Android devices. Besides, the videos purchased from iTunes Store before 2009 are protected by Apple’s FairPlay DRM system. To enjoy iTunes videos on your Android phone or tablet, you’ll need to get rid of DRM restriction and convert iTunes MOV/M4V to Android friendly format.